The Mister and I always talk about mixing thing up when we go out on a date since we don't get the opportunity very often, but always come back to the tried and true dinner and a movie. Don't get me wrong, we always have a good time, but it would be fun to try something different every now and then. I decided to search around for some date night ideas and found myself on Pinterest. Where else do ideas come from, right? I saw this Date Night Jar and thought this is just what we need. ﻿﻿﻿﻿﻿The idea was so clever and so simple at the same time. My favorite type of project. I love that you can choose low/no cost dates as well as move involved dates. This would give us the opportunity to have "dates" even if it was sitting in the living room while the girls are sleeping. I pretty much had everything on hand except the jumbo craft sticks that I picked up at Walmart. The box of 300 sticks was about $4 and I only needed about 30. The rest I'm sure will end up in the Art Closet I showed you in this post. 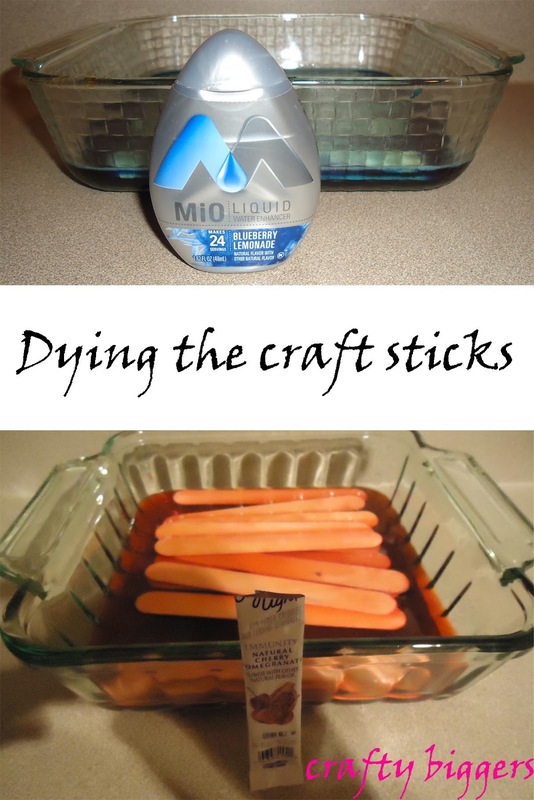 I pretty much followed right along with the tutorial for dying the craft sticks. I used Crystal Light for the pink ones and Mio/Food Coloring for the blue ones. I just put the sticks in an 8x8 inch pan with the drink mixes and enough water to cover them and left them there for a couple hours. While the craft sticks were drying, I started decorating my jar. I used a Mason jar that we got from the local farmers market. We had just finished the homemade jelly that was in it the night before so the timing was perfect. I soaked the label off then used goo-gone to take off the sticky stuff that was left behind. That part took the longest. Once I had it all cleaned up it was time to make it pretty. I decided on scrapbook paper and ribbon for mine. My scrapbook paper chose came in 6x6 inch pages and it didn't fit around the jar. At first I was disappointed because it was such a perfect color match, then I decided to turn it on the diagonal and it fit. I cut it on the diagonal to 2 1/2 inches wide and hot glued it on. Then I wrapped the matching ribbon around and made a simple knot in the front. I took a lighter to the cut edges just enough to seal them and added a dab of hot glue right under the knot to keep the ribbon from sliding. Here's how it all came together. A little bit different than the inspiration jar, but just as fun in the end. Super sweet! What a great idea! I'm your newest follower from the hop. I love tutorials! Thank you for sharing! I'm from the blog hop and would love for you to some see some of my tutorials and follow my blog! Oh my gosh. This is absolutely awesome. I love, love, love this idea! I might even make some for my children & a slightly different concept! I am hopping over from MINGLE! and I am so grateful I did! Hop on over to my place here!